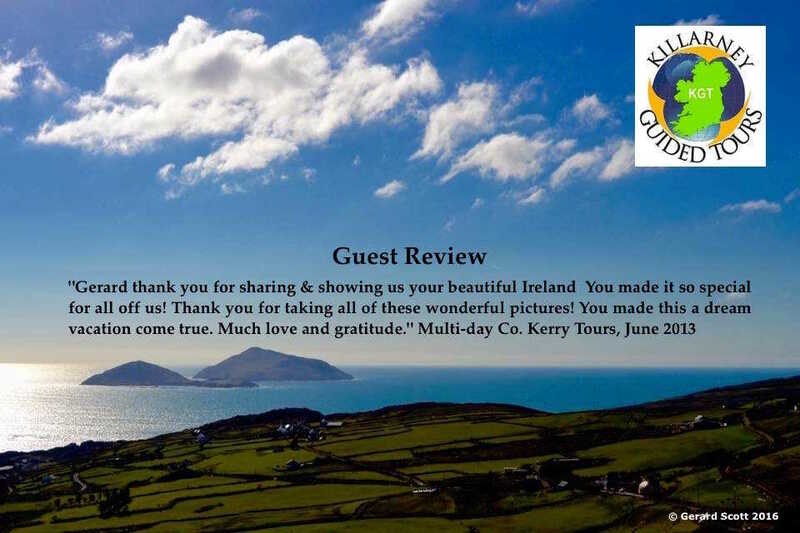 Killarney Guided Tours is proud to share a few words from our guests. 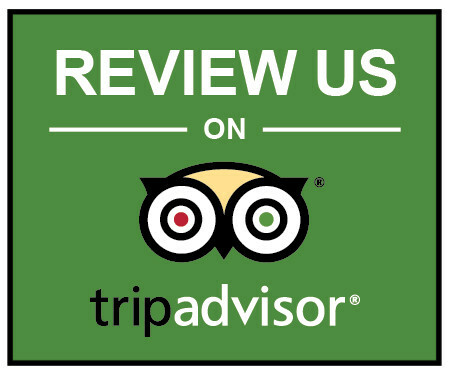 We welcome your feedback via TripAdvisor so we can share your experiences here. "You will not find a better tour guide than Gerard Scott (Killarney Guided Tours). We originally hired him for a two-day package. He was so terrific that we then added a third day...He asked us what kinds of things we are interested in before we even left for Ireland. Then as he learned more about us on the day-trips, he began making suggestions of things we might like to see...We could not have been more pleased with his services." Multi-day Tour, November 2018. "The Ring of Kerry was a major destination in our planning for our Ireland trip. We wanted a tour that wasn't run of the mill, get on a bus with set stops, that visited the basic touristy locations. We were looking for a guided tour for 4 that took you to the places the tour buses couldn't venture into. After reading reviews of the many ROK vendors we settled on Killarney Guided Tours. It turned out to be the bast decision we could have made and was the high point of out Ireland vacation." Ring of Kerry Day Tour, September 2018. "We have chosen Killarney Guided Tours since 2013 and continue to do so year after year. We will never trust our vacations to any other tour company. Each of our guides on this trip were professional and genuine, making our tours wonderful and relaxing. 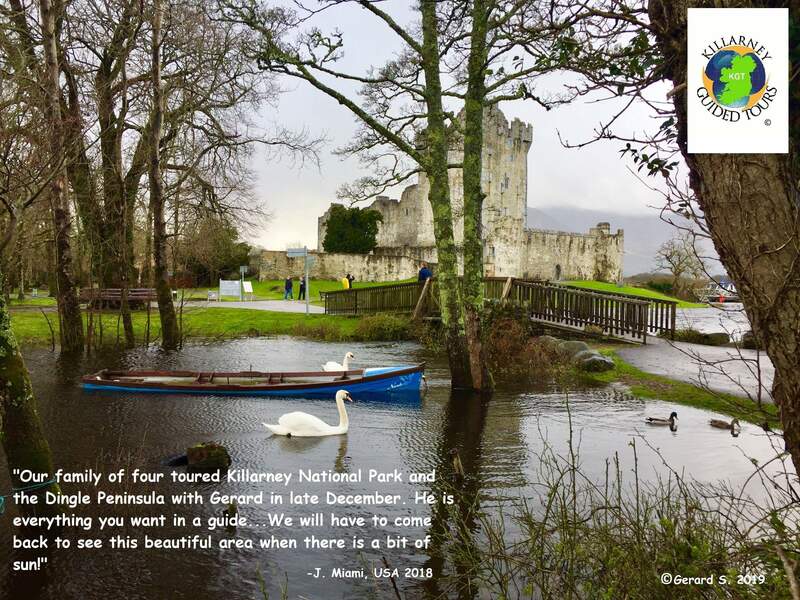 As we've said in the past, if you are looking for a luxury experience, but without any pretense, don't chance it - just choose Killarney Guided Tours." Multi-Day Tour, September 2018. "We never regret returning to Ireland or choosing Killarney Guided Tours as we have for years. Our latest trip touring from Galway to Killarney and all points in between was pure joy. Thanks again for another amazing vacation and we will continue to highly recommend. One suggestion to anyone deciding, definitely book Killarney Guided Tours as soon as you decide on your vacation dates so you don't risk a mediocre experience with another company." Luck of the Irish Tour, April 2018. "If I could give it a 10 I would. Great experience. The guide was very knowledgeable and fun all in one. I would recommend everyone take a tour with these guys!!" Day Tour, May 2018. 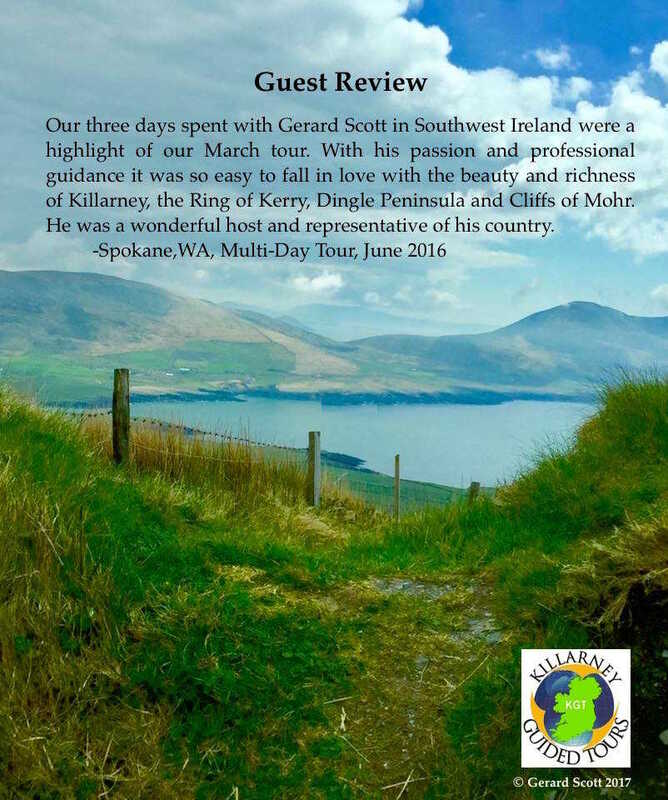 "My husband and I had two WONDERFUL DAYS touring the Ring of Kerry with Gerard. He is warm, friendly, so easy to be with, and very knowledgeable about County Kerry and Ireland. Gerard showed us Kerry’s famous sites, but the highlights of our time together were the places he took us that no bus tours ever go...So you can take a bus tour, and head to the major sites with tons of tourists, or you can enjoy Ireland the way it was meant to be experienced: with hospitality, warmth, and laughter as you view it’s stunning landscapes, discover it’s hidden gems, and learn about it’s history and culture. We’re so glad we chose to spend our time in Kerry with Gerard! Multi-Day Tour, June 2018. 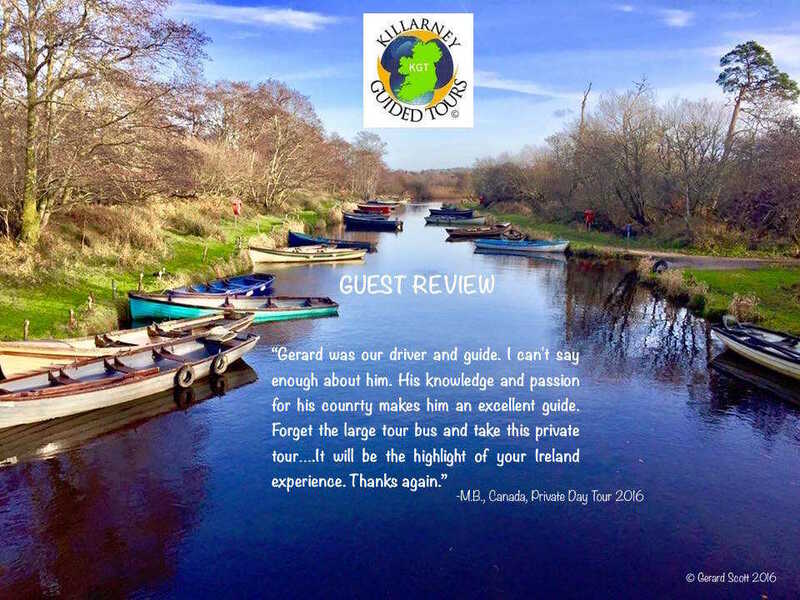 "Our tour with Killarney Guided Tours was everything we had hoped for. My 14 year old grandson wanted to see the Star Wars sites, so Gerard helped us put together an itinerary which also included many interesting and unexpected local side trips...I'm confident that you will enjoy your trip if you use Killarney Guided Tours. Day Tour, July 2018. "Best tour ever. We originally booked because the reviews were all positive, yet we were still blown away. Gerard took us to the best places and we loved each stop. He is incredibly kind and fun to be around. He knows a lot about the history of Ireland and could answer any questions we had. As a bonus, he is a great photographer so you don't have to worry about anyone being left out of group shots...The only downside to this whole tour is that any tour you do after won't compare. So worth it, I would recommend to anybody!" Multi-day Tour, February 2018. "[We] had the best time with Gerard. He was informative, a great sense of humor, on time, laid back, not intrusive but most of all showed us the Ireland that we wanted to see. We are already planning our 2nd & 3rd trip to Ireland and we are hoping that Gerard will do us the honor and continue to show us the beautiful country of Ireland!! Highly recommend." Multi-Day Specialty Tour, December 2017. 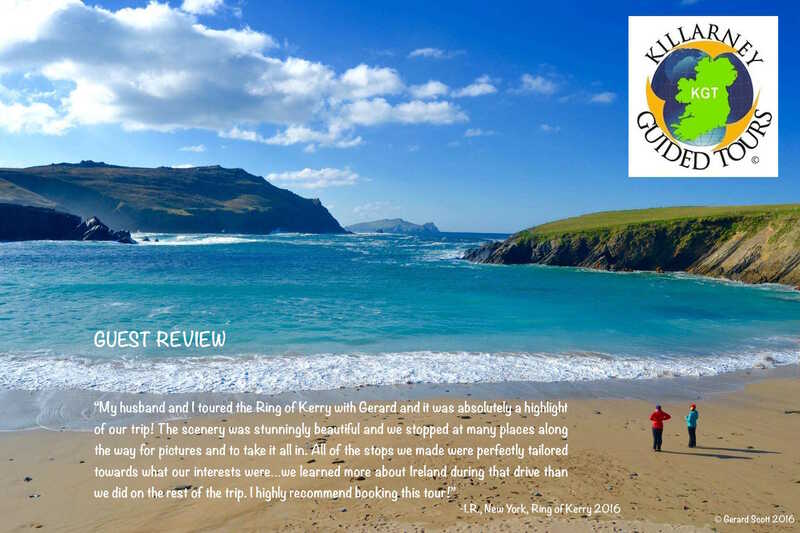 "We booked Gerard for 2 days (Ring of Kerry & Dingle Peninsula). He picked us up promptly at our B&B and returned us back at the end of the day. Unfortunately, the weather was terrible both days but Gerard did his best to make sure we got our monies worth. He was passionate about his homeland and regaled us with lots of stories, history and Irish music. He had great spots for photography and even with the weather, we got some great photos. When I mentioned that my future son-in-law is a golf pro, he even took us to an Irish golf course. And gave my husband some tips for an Irish ancestry website for research. Highly recommend." Multi-Day Specialty Tour, October 2017. "What a great day! My husband and I took a day trip to Dingle...Do not hesitate to book a day, or more, with Killarney Guided Tours! The sun was out, the day was lovely, and Gerard is so prompt, professional, flexible, patient, knowledgeable and genuinely nice, we couldn't have asked for more! His vehicle was top notch, clean and comfortable! To take in the breathtaking scenery while listening to Gerard and his love of the area and wealth of knowledge is second to none! He knows the best spots for perfect photos, and took many great pictures of us with the most astonishing backdrop, it's really something special that you won't get on a large tour bus or with any other guided tours! We will definitely be back to again to experience more with Killarney Guided Tours!! Dingle Peninsula Photography Day Tour, October 2017. "Very good tour. Knowledgeable, comfortable. Can't ask for more." Ring of Kerry Day Tour, 2016. "First and foremost, I have to thank Gerard for his help and dedication in making our engagement the most memorable moment. I contacted Gerard after reviewing his "marry me proposal tour", with the hope he would help me in the planning of my proposal, to my now fiance, during our trip to Ireland. After countless emails with Gerard, we were able to organize and capture such a special moment. This would not have been possible without Gerard!" Marry Me Specialty Tour and Multi-Day Tours, October 2015. "While taking the train from Dublin to Killarney, my travel companion and I were debating how to tour the Killarney area. Using Trip Advisor, we just happened to come across Killarney Guided Tours and decided to take the plunge. Best decision ever, a memorable day that proved to be the highlight of our 5 day Dublin-Killarney trip. Gerard is incredibly prompt, efficient, and knowledgable. Personally guided tours may cost more than the buses, but you will not miss your Euros and will take home a priceless experience." Day Tour, October 2015. "A day tour with Killarney Guided Tours was our favorite part of our trip to Ireland. Gerard is a brilliant guide!!! His knowledge of Ireland's history is extensive and he makes it fun to learn. We visited the Gap of Dunloe, Dingle, and Slea Head. All sites were absolutely breathtaking. Gerard is able to take you to several beautiful sites that are less touristy. We love things that are off the beaten path!! If you visit this area, we HIGHLY recommend booking a tour with Killarney Guided Tours." Day Tour, June 2015. "We've been to Ireland four times and yet, Killarney Guided Tours provided us with a unique experience of wonder and delight. Picking us up from our cruise ship port to visit one of the places we had missed in our previous visits, we started our tour in a comfortable Luxury car heading for Killarney....Yes, we may have been able to see the green of Ireland through a tour bus window along with 40 others as we stepped on an off a bus on the way to the usual tourist stores, but we were thrilled that even in only a day, we had the best of times with a quality guided hand in a small portion of Ireland as it is today along with the wonder of the past. It is for this reason I can highly recommend this company." Shore Excursion, May 2015. 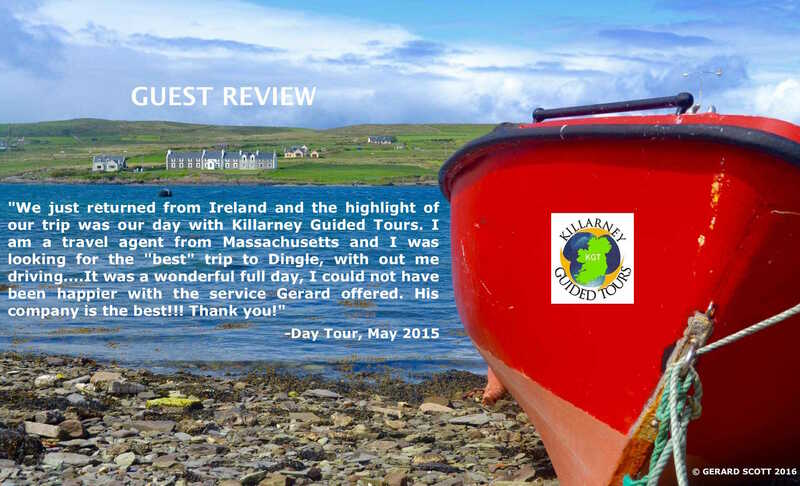 "I want to thank Gerard from Killarney Guided Tours for an amazing tour and recommend him to anyone that is looking for a tour in Ireland. He went way above and beyond what I would expect from a tour guide. He was very helpful throughout the entire experience....During the tour I proposed to my girlfriend (she said yes!). He went way above and beyond taking many photos of us and providing us with some champagne. The day was perfect. 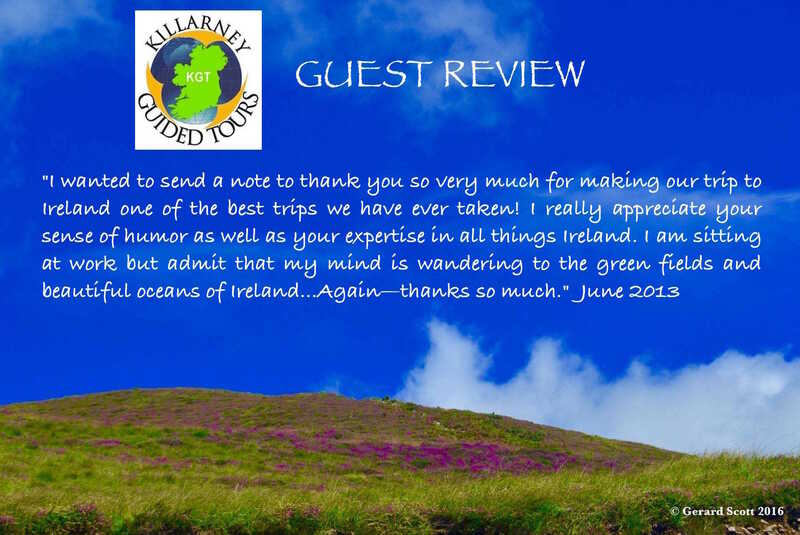 I could not have asked for a better expereince and would highly suggest Gerard with Killarney Guided Tours to anyone going to Ireland." The Marry-Me Specialty Tour, October 2014. "We can't express how truly relaxing and special you made our time in Ireland. Looking forward to exploring more of your spectacular country with Killarney Guided Tours on our next visit." West of Ireland Multi-Day Tour, May 2013.